Why would anyone buy a repaired rug? The answers are many: 1. 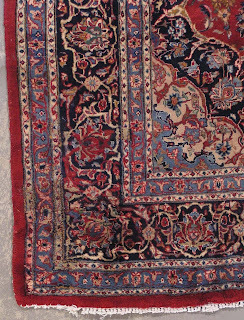 A repaired rug is usually one that was very good quality in the first place. 2. The cost of a repaired rug is a fraction of a non-repaired of similar value. 3. You are doing your bit for world-wide recycling. 4. You won't worry if your kids, dog, husband walk on it. 5. You can hide the repair under some furniture anyway..... Well you get the picture (actually 2 pictures in this case). 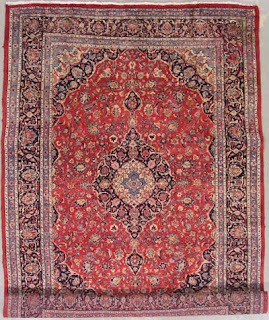 This 70-80 year old Persian Kashan is very heavy and is in generally very good condition. You can see that the pile has been rewoven in a number of areas (on the close-up photo) Pile loss was probably do, in this case, to wool moths. This is NOT the best repair job I have seen, but the result is a rug, that sold new for many thousands of dollars, selling now for only $450, right now the lowest price I have on any room sized rug. The truth is, that unless the repair is pointed out, most people don't seem to notice anyway! Click on photo to enlarge! These look great and when you have a chance check out www.artisansvt.com and become a follower!